but don't say we didn't warn you!!! Rescue a princess from a potent mage! He's holding her at the fabulous mines of the dwarves in the Valley of the Tiraval. Compatible with all major FRP systems, including Thieves' Guild!! Published by Gamelords, Ltd. 1983. Reviewed in Different Worlds #35. 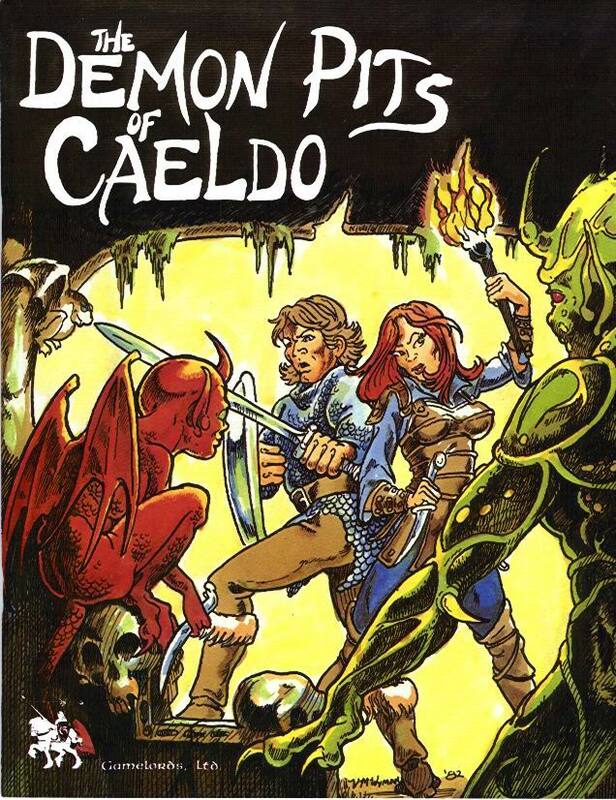 In the depths of the crumbling castle of the former Barons of Caeldo lies immense treasure - and terrible danger. 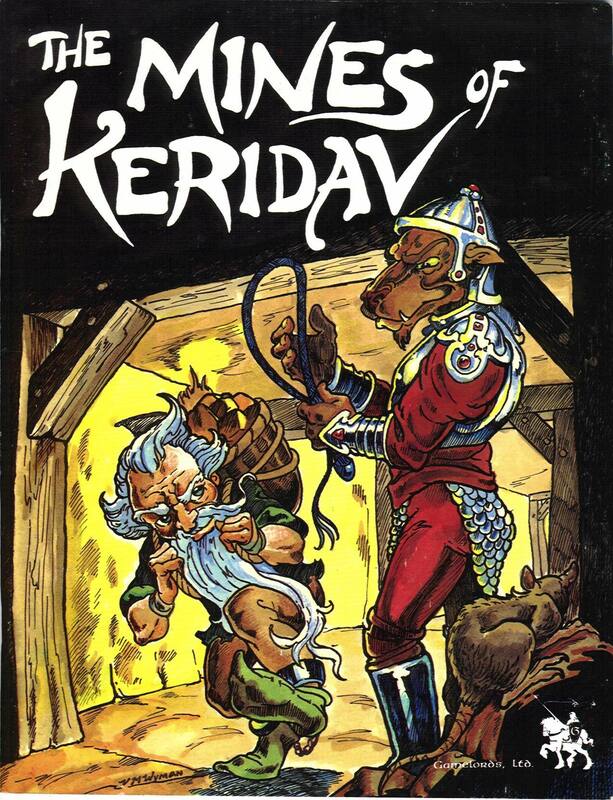 A companion to The Mines Of Keridav. Here, too, you'll meet Aril Malus, the self-styled Keeper of the Forests and his sworn enemy Morkash the Desecrator; Emil Jaggoh, the wily head of the Hadite government's secret espionage network, the Ebony Band; rugged loggers and woodmen of all stripes; and scores of other residents and transients through the Land. Players can visit Kindler's Glade, the wildest frontier town this side of the Old West, dare the swift currents of the Thunder River, or try their own hand at hunting the great beasts of the wilderness - all against a backdrop of political intrigue and high magic. 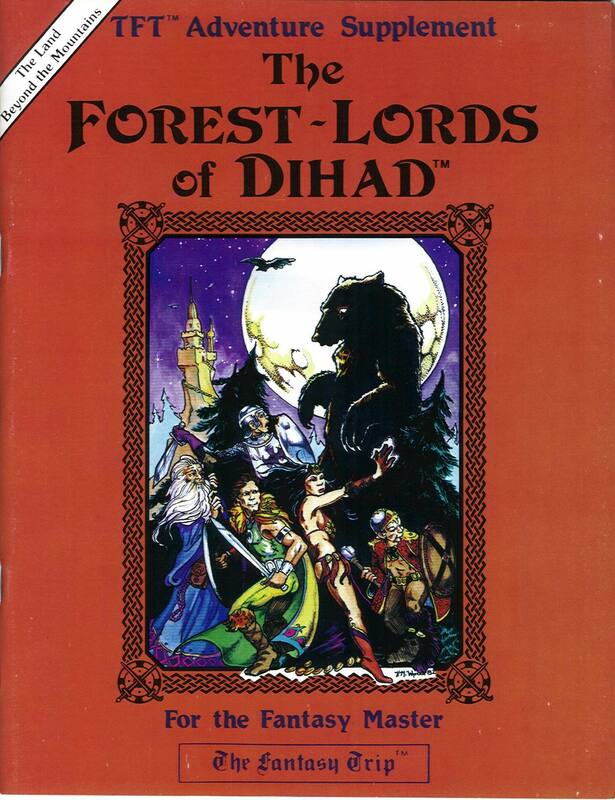 Forest Lords of Dihad is part of The Land Beyond the Mountains, a complete campaign universe for use with The Fantasy Trip being jointly developed and published by Metagaming Concepts Inc. and Gamelords Ltd. Each campaign pack in the series is designed to stand alone as an independent set of encounters and scenarios to test the mettle of any experienced TFT adventurer. Combined with the other releases in the series, these adventure supplements will form a vast and changing mosaic of a world in the midst of a chaotic struggle for survival, where riches ad power await the adventurer who is both wise and brave. Playablity: For 2-8 intermediate or advanced level players and a moderately experience Fantasy Master. Components: 32 page rules booklet with 17"x11" full color map. 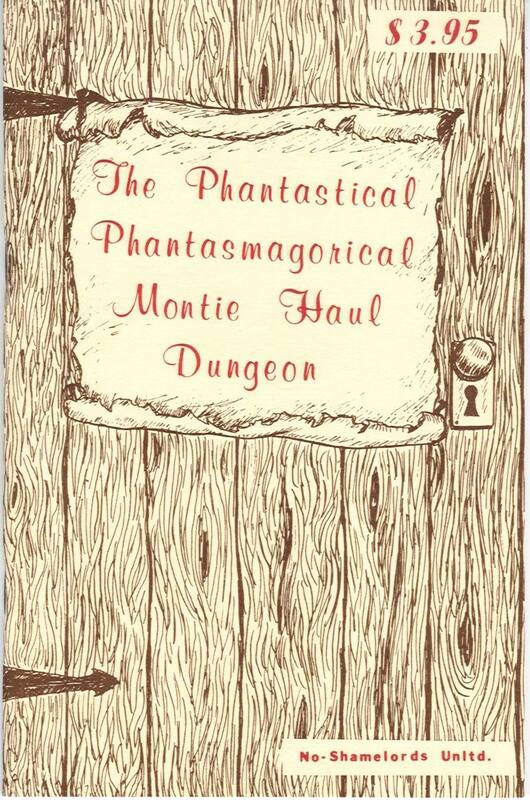 Requires: In addition to this book you must have The Fantasy Trip booklets In The Labyrinth, plus either the Advanced Melee and Advanced Wizard booklets or the Microgames Melee and Wizard to play this adventure.